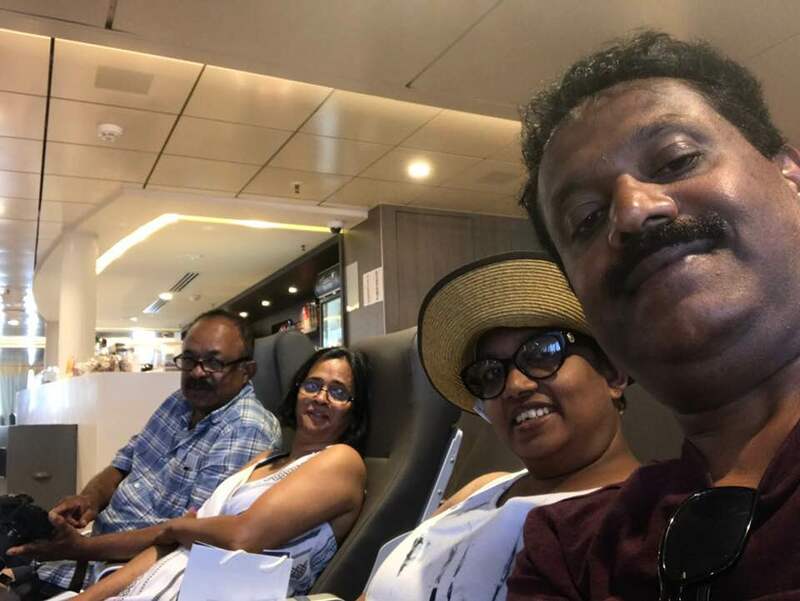 On June 13, after breakfast, we sailed from Mykonos to Santorini Island in a high-speed ferry. The voyage lasted over two hours. The ferry offered comfortable seating and a few restaurants, but the menu was expensive as seen in all ferries in Greece. Crescent-shaped Santorini or Thíra in the Aegean Sea, is a group of islands consisting of Santorni, Therasia, Aspronísi, Palea and Nea Kaméni. Santorini, the youngest volcanic land in the Eastern Mediterranean, is still an active volcano and probably the only volcano in the world whose crater is in the sea. 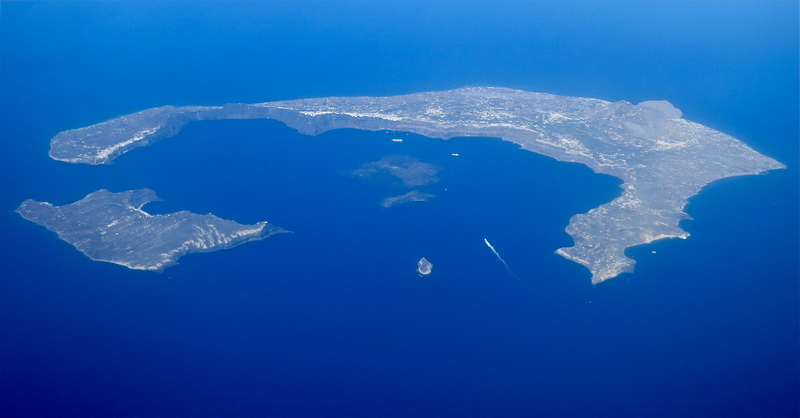 The islands that form Santorini came into existence as a result of intensive volcanic activity. 12 huge eruptions occurred, one every 20,000 years approximately, and each violent eruption caused the collapse of the volcano’s central part creating a large crater (Caldera). The volcano, however, managed to recreate itself over and over again. The last big eruption occurred 3,600 years ago during the Minoan Age, when ash, pumice and lava stones covered the islands. The eruption destroyed the thriving local prehistoric civilization, evidence of which was found during the excavations. The solid material and gases emerging from the volcano’s interior created a huge vacuum underneath, causing the collapse of the central part and the creation of today’s Caldera– with a size of 8×4 km and a depth of up to 400m below sea level. 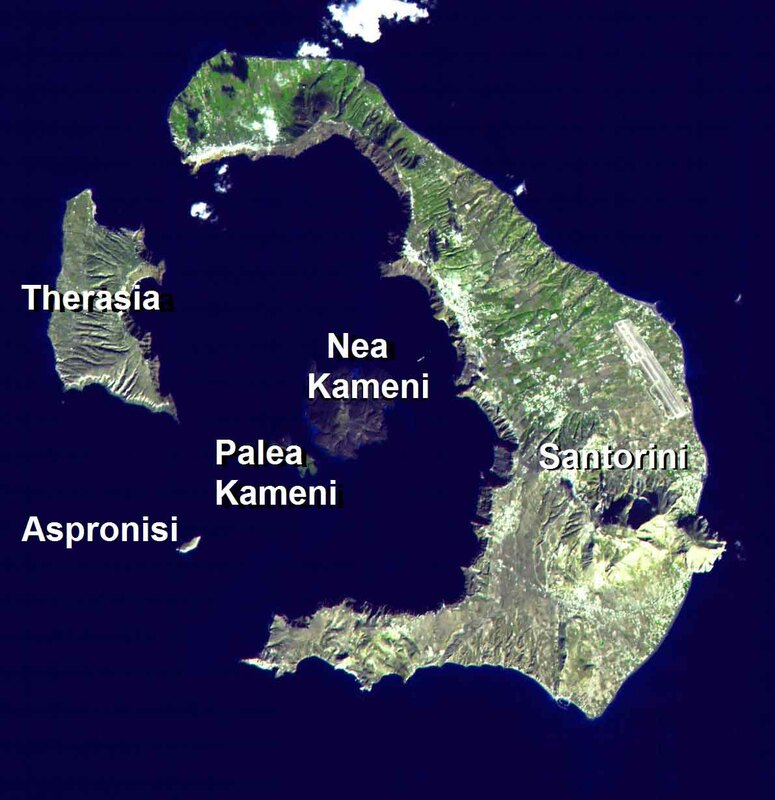 Eruption of the submarine volcano Kolúmbo, located 6.5 km North-East of Santorini, on 27 September 1650, was actually the largest recorded volcanic eruption in Eastern Mediterranean during the past millennium. The most recent volcanic activity on the island occurred in 1950. The whole island is actually a huge natural geological/volcanological museum where you can observe a wide range of geological structures and forms. 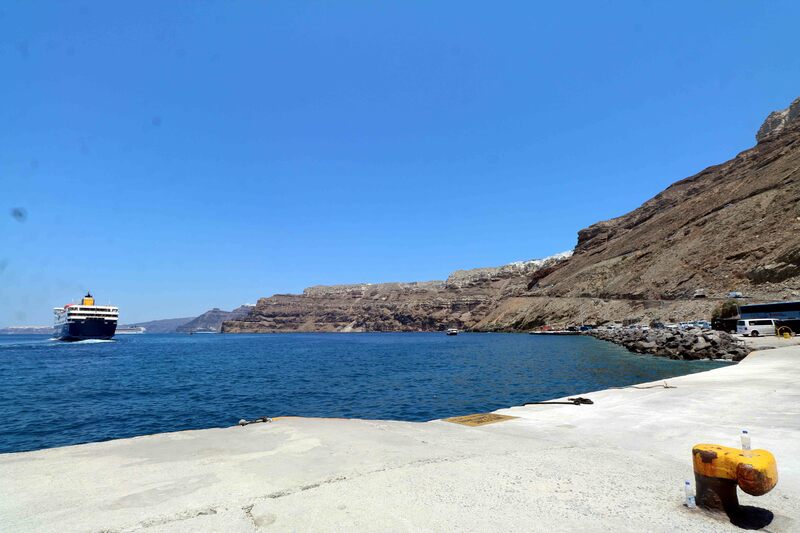 Caldera is a lagoon of sea water surrounded on three sides by the steep cliffs of Santorini and on the fourth side by the island of Thirassia, which was part of Santorini before the eruption. The currently active volcano on the island of Nea Kameni sits in the middle of the Caldera. It is active but presently not at risk of erupting. As our ferry pulled closer to Santorini Island, we could see the steep escarpment of Santorini Island formed due to volcanic activity. 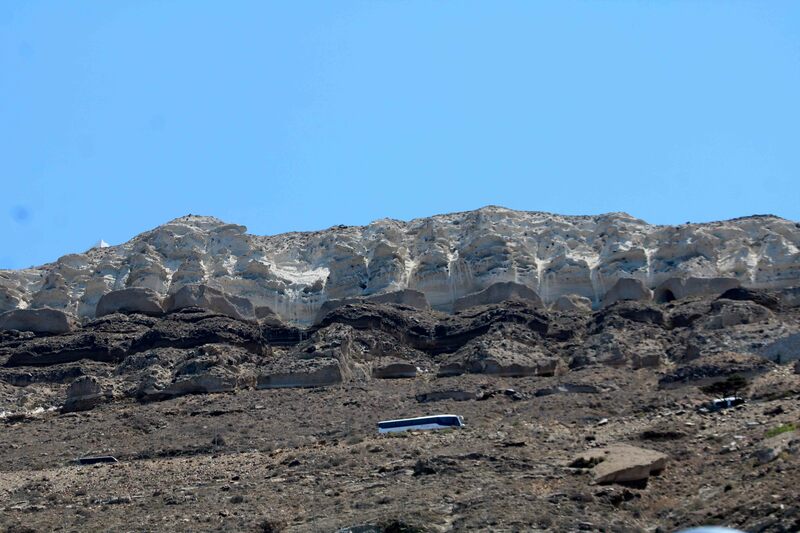 The colours of different layers of rocks up the escarpment is due to lava deposited during various volcanic eruptions. The upper crust is mostly pumice and below it is red and black granite. 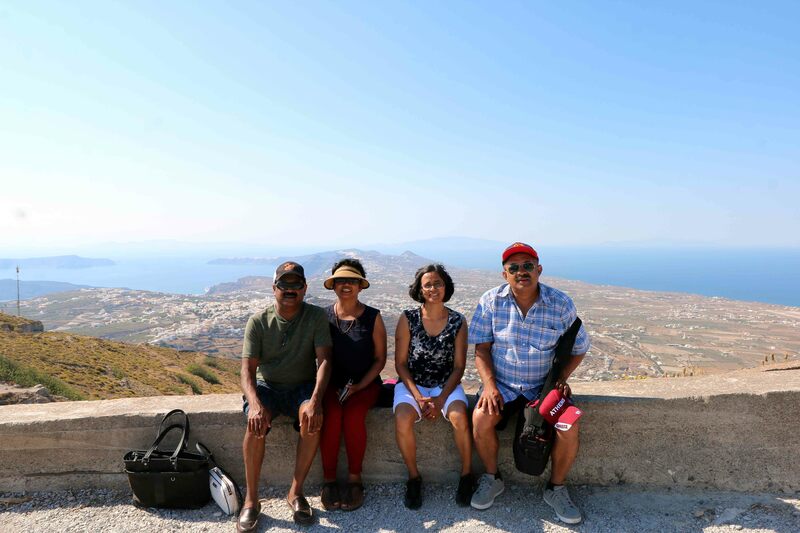 We checked into our hotel and post lunch set out to explore Santorini. 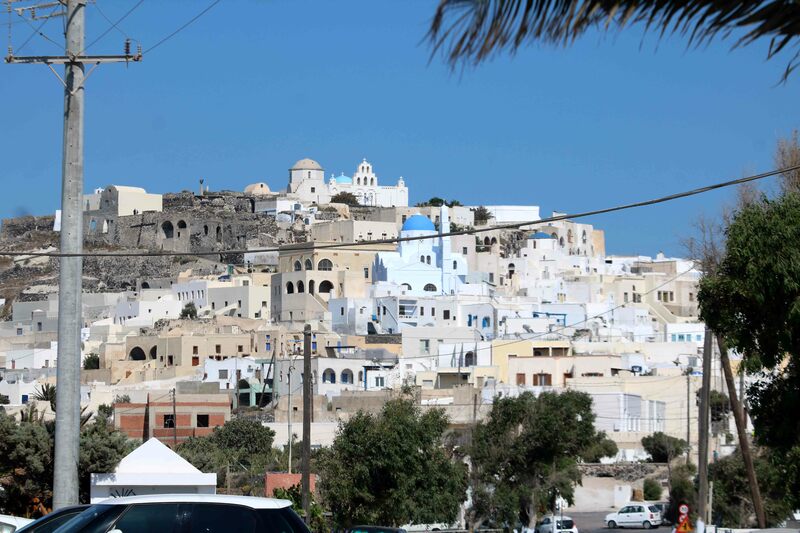 Our first halt was Pyrgos, a medieval settlement that is nestled at the highest spot of the island. We drove up to the entrance of the settlement by taxi. As the village lanes are narrow and cobblestoned, we had to walk up to the castle and churches atop the hill. On to the left of the image above is the castle, which is well-preserved despite the serious damage caused by the earthquake of 1956. It was built to protect the people from marauding pirates. 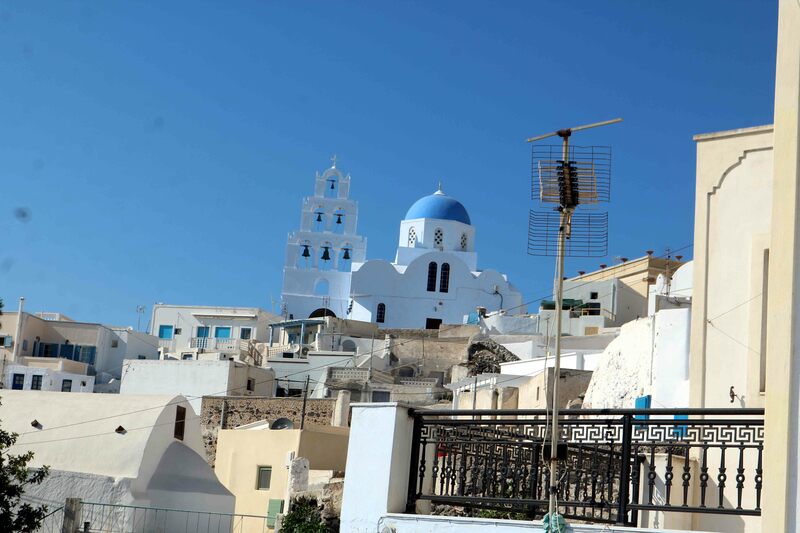 Pyrgos is said to be the first capital of Santorini, before the onset of the 19th century. It is built on top of a hill overlooking the Aegean Sea, which makes it an exceptional observatory. As we walked up the track, close to its entrance to the castle lies the church of Agia (Saint ) Theodosia. This church was built in 1639 and renovated in 1857, but it collapsed in the earthquake of 1956. In its place, the present church was built in 1965. Further uphill we walked and came to the church of Christos. The bell tower of the church is visible from a distance. This is the only church on the island with an octagonal cupola while the rest have a round cupola on top. The bell tower and the yellow flag of Greek Orthodox Church resembles that of old Syrian Orthodox churches of Kerala. We walked downhill and drove to the village of Megalochori. 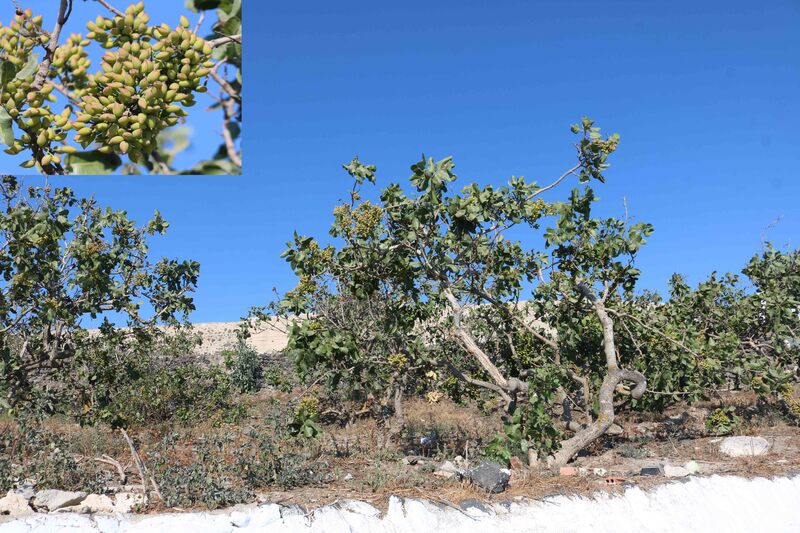 Here we all for the first time saw a Pistachio tree with fruit. The debate that erupted amongst us was as to whether Pistachio is a nut or not. Pistachio, though known as a nut, the fruit of the Pistachio is botanically a drupe, a type of fleshy fruit (like a coconut), the edible portion of which is the seed. 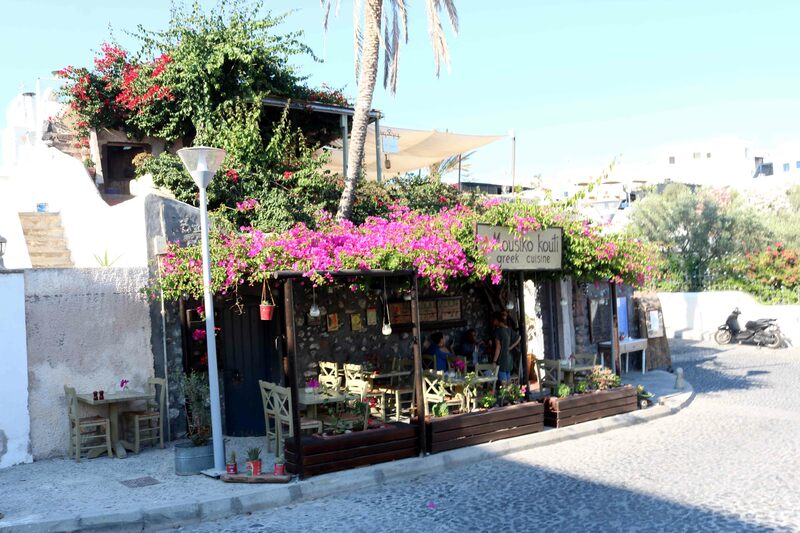 Megalochori offers a nice mix of white Cycladic (Cyclades –a civilisation that existed in the Bronze Age) houses, several churches and narrow alleys. 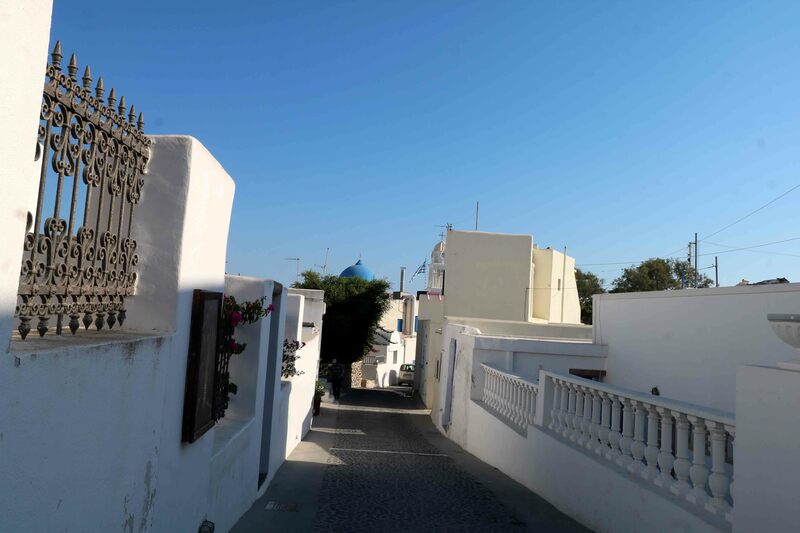 A prominent feature of the historical homes and mansions are the high walls, inner courtyards and solid wooden door entrances, built for privacy and for safety against pirates. 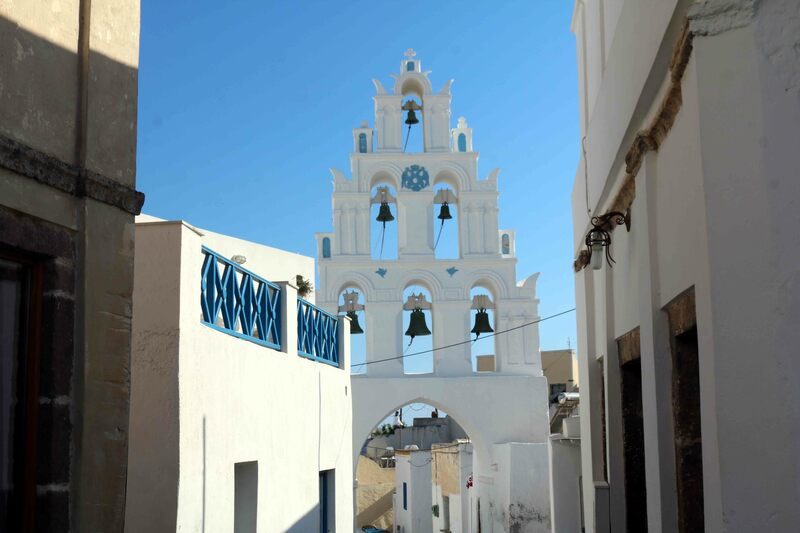 Megalochori has two well-known bell towers spanning the street. This one is part of the Panagia church and is characterised by the clock on top. Megalochori is famous for its winery and wines and we went ahead to visit a winery, covered in the next part. Every travelog of yours takes me there too…and thanks for pistachio fruit knowledge..
With new information about the volcanos & Pistachio.